Plastic Design & Engineering | Drader Manufacturing Industries, Ltd.
Whatever the phase of your project, whether starting from scratch or validating the manufacturability of a prototype, Drader can help you manage an existing project or bring an idea to fruition. Drader is backed by generations of plastics design experience and mechanical assembly. With skilled engineers and designers on our team, as well as top software and technology to work with, we connect our customers to their end goal by helping them transform an idea into a product we can manufacture. Our customers come to us to create a prototype they can test in their market. Our Product Lifecycle Management (PLM) is our complete product design process, where we help you design a product from scratch and develop it through to application. 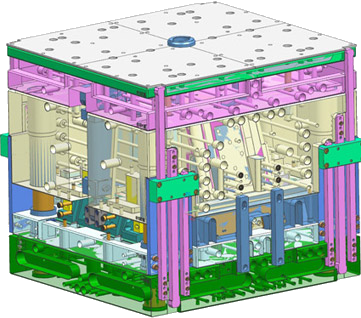 The design phase of our PLM process considers all aspects of your project from mold engineering and material capabilities to packaging design and lowering manufacturing costs. We choose to work with the best, most sophisticated design software. Building a prototype using 3D Printing is key to our customer’s capability to sell their ideas and products and know that it is perfect before the steel mold is created. When a prototype has been perfected, we are your project manager for mold trials and testing to ensure your product is exactly what you expected. Our Full Project Management services involve a project that you might have already started. You might be looking for 3D printing of a prototype, or wanting to validate the manufacturability of your product—that is, you want to verify a mold can be designed to create a consistent product. Our project management services also involve choosing a mold building option. Molds can be built in Canada or with our partners overseas, both of which can be project managed by Drader to ensure the end product is a success. Whatever the stage of your project, Drader is a reliable and experienced partner to help you bring your vision to life.